Detecting whether a patient will have acute kidney injury could become as simple as dipping a paper test strip printed with gold nanorods into a urine sample, a team of Washington University in St. Louis researchers has found. Srikanth Singamaneni, PhD, assistant professor of engineering, along with Evan Kharasch, MD, PhD, and Jerry Morrissey, PhD, at Washington University School of Medicine, have developed a biomedical sensor using gold nanorods designed to detect the elevation of the protein neutrophil gelatinase-associated lipocalin (NGAL), a promising biomarker for acute kidney injury, in urine. Biomarkers are typically small molecules or proteins in the body whose concentration changes in response to disease or therapy. Srikanth Sinamaneni, PhD, and the research team used a process called biomolecular imprinting to create the plasmonic biosensor. This process involves attaching the target proteins to the surface of the nanorods, then adding small molecules around the proteins to form a polymer layer around the outside of the nanorods. The target proteins are removed to leave cavities on the surface of the nanorods, which are the artificial antibodies. When the nanorods with the artificial antibodies are exposed to a substance, such as urine, that contains the target protein, those proteins settle into the cavities, similar to a puzzle piece fitting into a jigsaw puzzle. Acute kidney injury, which occurs when the kidneys become unable to filter waste products from the blood, develops rapidly over a few hours or a few days. It is common in people who are hospitalized, particularly in those critically ill people or who have had heart surgery. To date, there have not been any sensors that can easily detect if a person will experience acute kidney injury. To create the sensor, the team used a technique called plasmonic biosensing, which is capable of detecting very small quantities of biomarkers. However, natural antibodies have a short shelf life and are expensive and time-consuming to develop and apply, so Singamaneni and the team created artificial antibodies. To create the plasmonic biosensor, they used a process called biomolecular imprinting. 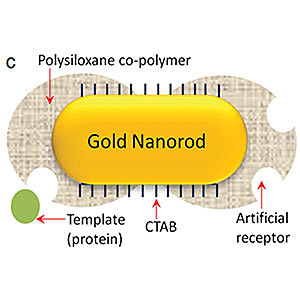 This process involves attaching the target proteins to the surface of the nanorods, then adding small molecules around the proteins to form a polymer layer around the outside of the nanorods. The target proteins are removed to leave cavities on the surface of the nanorods, which are the artificial antibodies. When the nanorods with the artificial antibodies are exposed to a substance, such as urine, that contains the target protein, those proteins settle into the cavities, similar to a puzzle piece fitting into a jigsaw puzzle. The team plans to use its success using NGAL as the biomarker as a model for replacing natural antibodies with artificial antibodies for other proteins. In 2010, Kharasch and Morrissey, research professor of anesthesiology, found that the proteins aquaporin-1 and adipophilin were elevated in the urine of patients with the most common forms of kidney cancer. Abbas A, Tian L, Morrissey J, Kharasch E, Singamaneni S. “Hot Spot-Localized Artificial Antibodies for Label-Free Plasmonic Biosensing.” Advanced Functional Materials. Advance online publication Nov. 2, 2012. Funding for this research was provided by the Office of Congressionally Directed Medical Research Programs of the U. S. Department of Defense and by the St. Louis Institute of Nanomedicine and by the National Institutes of Health (NIH).